Before you start your day, start a fabulous dinner! Turn your crockpot on the low temperature setting. Brown the ground turkey and onions (rinse if necessary), add to the crockpot along with garlic and Perfect Chili Powder. Give it a stir. Put lid on and have a fantastic day! After 6-8 hours, or about 1 hour prior to dinner, add the kidney beans and check to see how thick the Chili is. If you want it thicker, combine 1 beer (or chicken broth) with 1/4 masa harina (corn flour) or regular flour mix well to remove lumps and add to chili and stir. 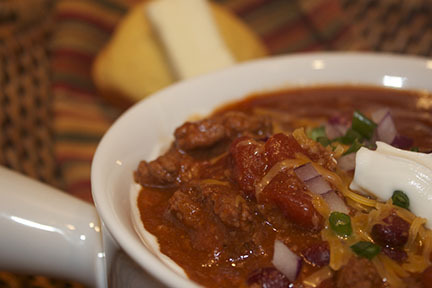 To serve, some great additions are cheddar cheese, chopped red onion, sour cream and corn bread. Enjoy!